Simple, menu driven setup The controllers feature simple, menu driven setup choices. No special programming skills or software tools are required to choose applications, enter setpoints, set network addressing, and balance airflow. All options can be set by using only an STE-8001 sensor which can be installed as the permanent room sensor or temporarily connected as a technician’s service tool. New or retrofit applications The SimplyVAV controllers are ideal for new installations or upgrades of older, less efficient controllers. 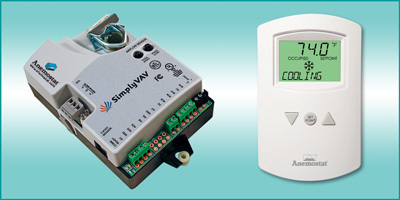 Easy system integration For SimplyVAV installations that are part of a BACnet building automation system, the controllers provide system diagnostic indicators. Through the MS/TP network, the controllers signal demands for higher static duct pressure, cooler or warmer supply air, and when to start air handler units.